When should I start seeds indoors so they are ready to transplant outdoors in the spring? Onions: 8 to 12 weeks before the set out date, which is 4 to 6 weeks before last frost (in total, 12 to 18 weeks before last frost). Lettuce: 5 to 6 weeks before the safe planting-out date, which is 4 to 5 weeks before the last frost (in total, 9 to 11 weeks before last frost). Beets, Cabbage, broccoli, collards: 4 to 6 weeks, which is 2 weeks before last frost date (in total 6 to 8 weeks before last frost). Peppers: start 8 to 12 weeks before the last frost, and plant 2 weeks before last frost date. Cucumbers and melons: start 8 to 10 weeks, and set out 2 to 4 weeks after the last frost. Fill your container with 3-4 inches of starting mix. Moisten thoroughly with warm water. Place three seeds end to end, the length of this line is how deep you should plant the seed. For example, plant peas about 1 in. deep; spinach seeds, 1⁄4 in. deep. Tiny seeds like lettuce and parsley should be broadcast (sprinkled) across the top of the soil or planting medium and then covered ever so lightly with your planting mix. When broadcasting, be sure not to sow too many seeds. Once you have planted seeds, you must keep the planting medium moist and warm. Check seed packet for further information. Check the soil daily to ensure it is not dry. Light is necessary once the seedlings emerge. 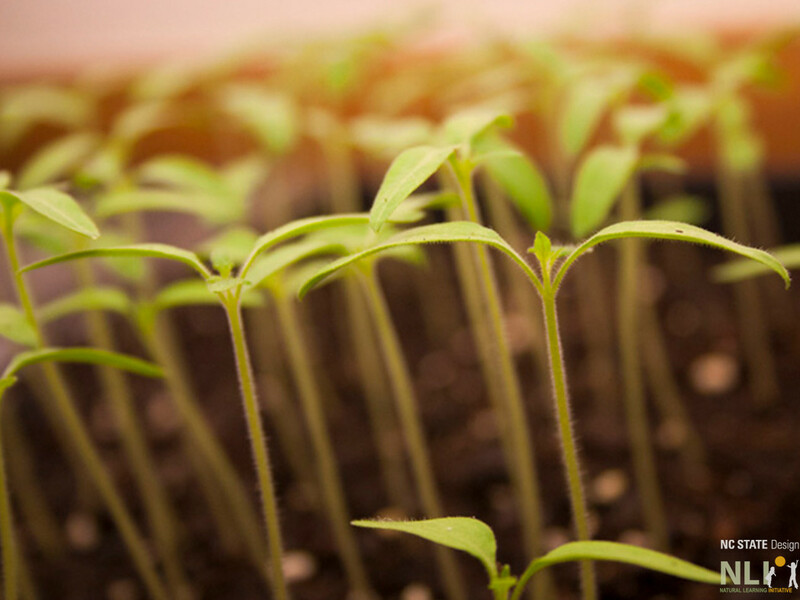 Seedlings need 12 to 16 hours of light from the sun, grow lights or fluorescent lights. 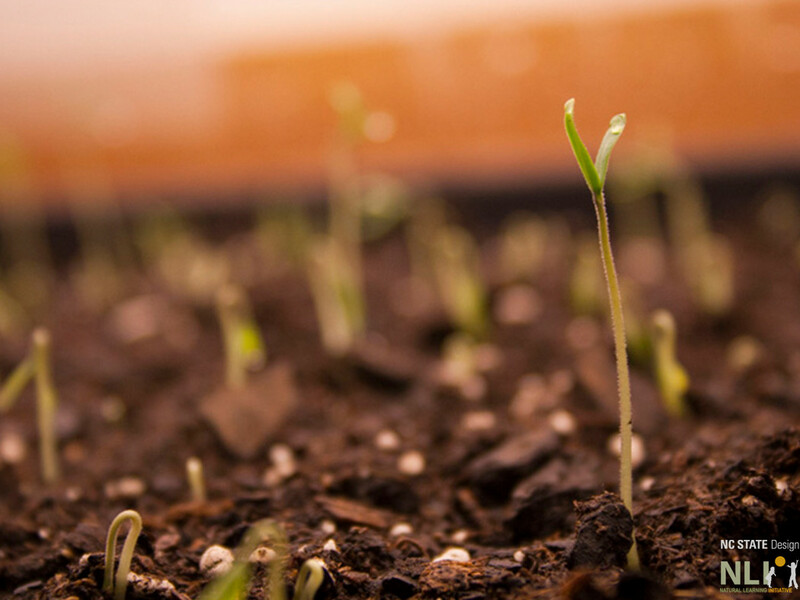 As seedlings emerge, you may need to thin them to ensure they have enough space to grow. 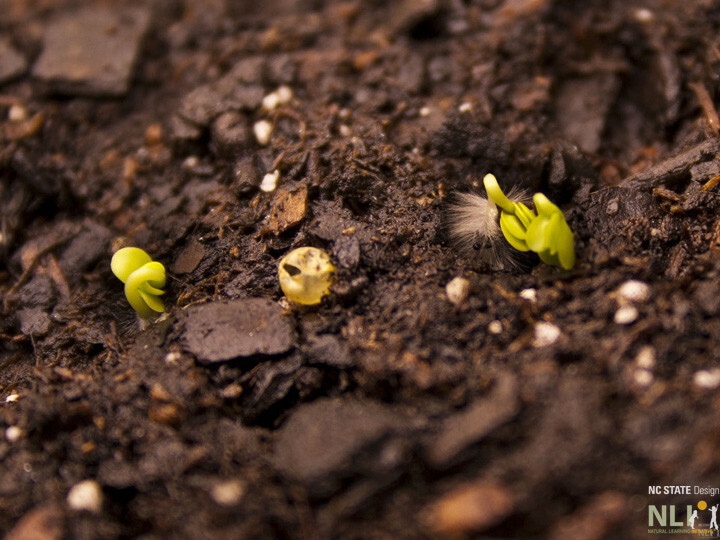 Seedlings just begin to emerge from the soil. What do you think the “white fuzz” is? A tomato seedling stretches upwards towards the grow light. Tomato seedlings ready for thinning. Seedlings nearly ready for planting grow in a greenhouse. 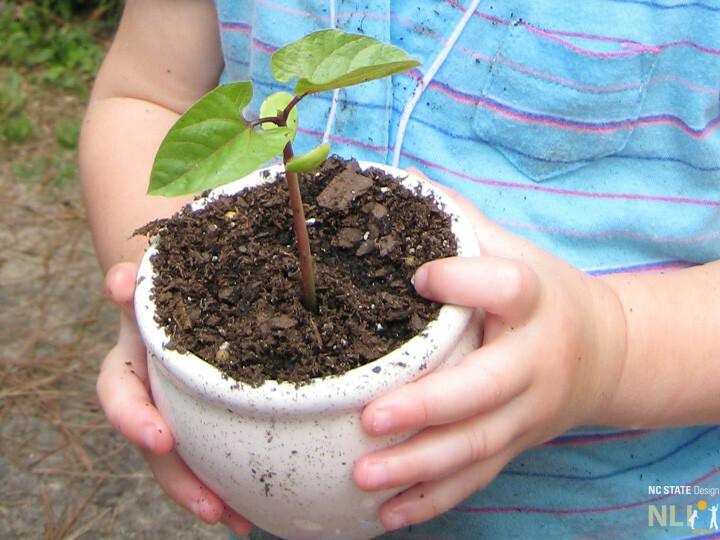 A child proudly displays her seedling grown as a Mother’s Day gift.